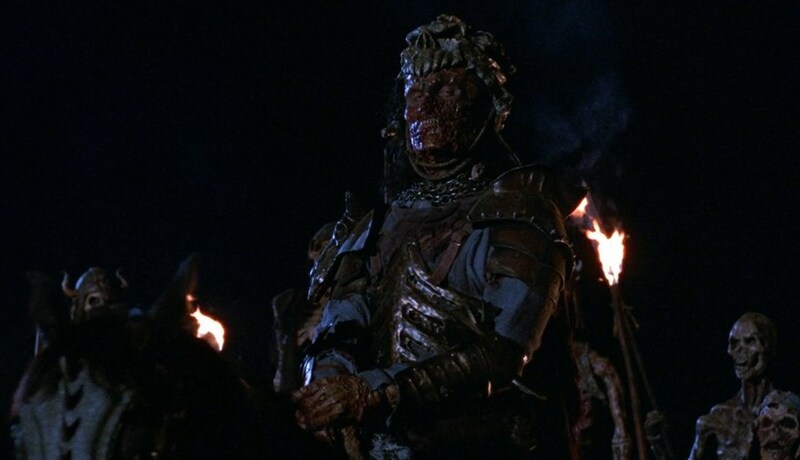 ARMY OF DARKNESS: Knuckleheads Of The Living Dead – Schlockmania! It’s easy to forget that Sam Raimi got into being a horror filmmaker by accident. He made The Evil Dead because he wanted to break into the feature film business and the horror genre that was easiest to capitalize on as an independent filmmaker. If you look back at the shorts he and his crew made in their teens, they’re almost all zany comedies. When The Evil Dead made it possible for him to get the backing of a Hollywood company for his next film, he made Crimewave – a comedy. However, it’s The Evil Dead that captured the imaginations of viewers and he quickly made Evil Dead II when Crimewave, a victim of studio tampering, failed to take off. Evil Dead II added overt humor to the Evil Dead formula and the rollercoaster results were another hit. 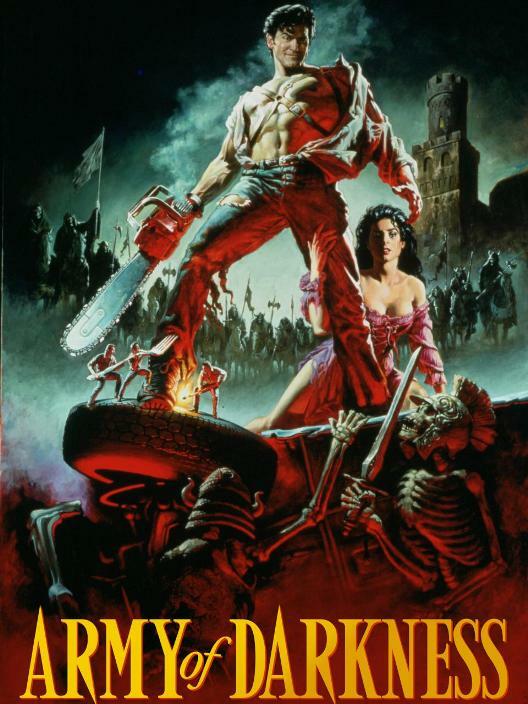 When he made his third film in the series, Army Of Darkness, it’s obvious he was burnt-out on being associated with horror as the resulting film is more of a fantasy adventure with a hefty dose of slapstick humor. It didn’t do well at the box office but it became a favorite with cult movie types… and it’s a million miles away from the original Evil Dead. 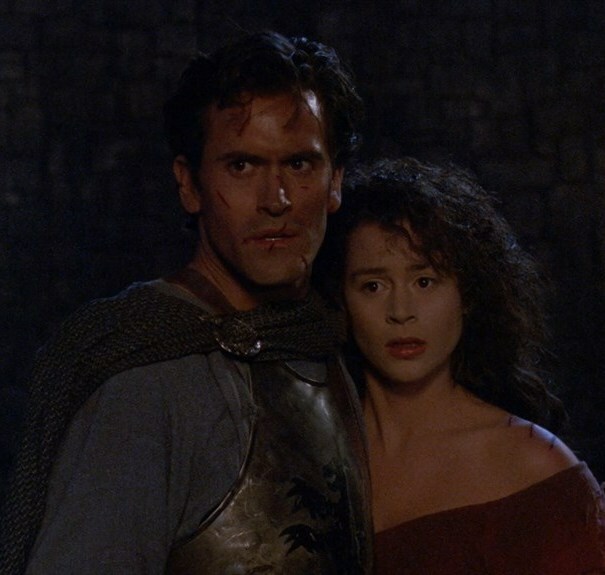 Army Of Darkn ess begins where Evil Dead II left off with Ash being transported back to medieval times. He quickly discovers that the Deadites he dealt with in modern times are running amuck in this time. It turns out his arrival has been prophesized and he is pressed into service by Lord Arthur (Marcus Gilbert) and fair maiden Sheila (Embeth Davidtz) to retrieve an ancient book that can stop the Deadites – but when Ash messes up an incantation, a Harryhausen-esque army of skeletons is awakened and they lead an attack on the kingdom. Once again, he must reluctantly become a hero to protect the kingdom and find his way home. 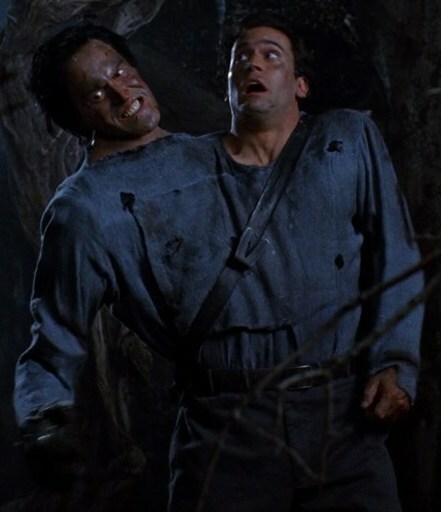 Army Of Darkness has become a fan favorite over the years because it offers a wild barrage of makeup effects, visual effects and stunts with kinetic verve. Raimi is obviously having a ball behind the camera and never gives his audience the time to get bored. However, there is a vocal minority of Evil Dead fans who prefer the first two Evil Dead films to this one because they consider Army Of Darkness to be too silly for its own good. Fanboys might not like this line of thinking but the dissenters have a point. The film’s aggressively campy approach undercuts sequences that should have suspense or scares and thus the film loses the laughs-then-scares rollercoaster feel of Evil Dead II. Army Of Darkness is pretty much a camp comedy from start to finish – and a weakly written one at that: characterizations are nonexistant and the flimsy plotting is strictly there to prop up the setpieces. Worst of all, Army Of Darkness reduces Ash, who was a sympathetic everyman hero in the first two films, to an arrogant, bumbling buffoon who reacts to the story’s demands in selfish and sometimes cowardly ways. It’s obvious that Raimi and company consider the idea of making such a character the hero of the film to be a hilarious gag but it’s the kind of gag that quickly becomes grating for those who aren’t enamored with it. That said, if you can rol l with the gleeful silliness, the kinetic verve of Army Of Darkness is enough to dazzle your eyes and ears. Raimi throws in every effect he can think off – makeup effects, opticals, stop-motion animation, rod puppetry, rear projection, etc. – and the film’s climactic sequence deploys them all in a way designed to appeal to the genre fan’s inner “monster kid.” More importantly, Campbell puts in a heroic performance as Ash, showing charisma, comic timing and the fortitude to get through an array of stunts and effects-driven abuse from his director. Thus, the appeal of Army Of Darkness will depend on your tolerance for fanboy-friendly silliness – but everyone can agree that it packs in an impressive amount of budget-conscious spectacle.